The Teratornithidae are a group of New World birds of prey, which includes the largest known flying bird, Argentavis magnificens Campbell and Tonni, 1980 from the late Miocene of Argentina, whose wingspan has been estimated at 6-8 m (Campbell and Tonni 1983). Teratorns closely resemble the Cathartidae in many osteological features, and some bones were initially indeed mistaken for those of New World vultures (Miller 1910). Although most earlier authors (e.g., Brodkorb 1964) assumed a close relationship between teratorns and New World vultures, others (e.g., Campbell and Tonni 1980) emphasized the differences between these taxa and considered teratorns to be more closely related to "pelecaniform" birds. A sister group relationship between the Cathartidae and Teratornithidae is, however, well supported by derived skull features, most notably the fusion of the prefrontal, ectethmoid, and frontal bones (Miller 1909). The only Paleogene fossil record of the Teratornithidae comes from the late Oligocene/early Miocene of the Taubate Basin in Brazil and was described as Taubatornis campbelli by Olson and Alvarenga (2002). The species is only known from the distal end of a tibiotarsus and the proximal end of an ulna, and is the smallest representative of the Teratornithidae. As noted by Olson and Alvarenga (2002), T. campbelli supports the hypothesis that the Teratornithidae are of South American origin and did not reach North America until the late Neogene (Campbell and Tonni 1981). A South American origin of the Teratornithidae suggests that the stem species of the Cathartidae also lived on this continent. However, two putative stem group representatives of this taxon, Diatropornis ellioti (Milne-Edwards, 1892) and Parasarcoramphus milneedwardsi Mourer-Chauvire, 2002, were reported from the Quercy fissure fillings (Cracraft and Rich 1972; Mourer-Chauvire 2002). Whereas several carpometacarpi and tarsometatarsi of D. ellioti were identified in middle and late Eocene (MP 16-17) deposits, P milneedwardsi is only known from a single tarsometatarsus of unknown age (Mourer-Chauvire 1988a, 2002). The tar-sometatarsus of D. ellioti closely resembles that of extant Cathartidae, but that of Parasarcoramphus has a more dorsally projecting trochlea for the fourth toe, which is more widely separated from the trochlea for the third toe, and bears a more markedly plantarly directed wing-like flange. A caveat that has to be placed on the classification of these birds is that comparisons were so far restricted to the Cathartidae. As the tarsometatarsus and carpometacarpus of teratorns closely resemble the corresponding elements of New World vultures, there remains a possibility that Diatropornis and Parasarcoramphus are actually stem group representatives of the clade (Teratornithidae + Cathartidae). A putative New World vulture from the Paleogene of North America, Phasmagyps patritus Wetmore, 1927, is based on a distal tibiotarsus from the late Eocene (Chadronian) of Colorado. 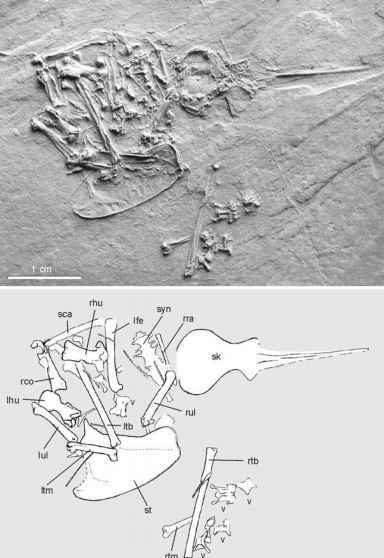 Another Paleogene New World record of the Cathartidae is Brasilogyps faustoi Alvarenga, 1985 from the late Oligocene/early Miocene of the Taubate Basin in Brazil (Alvarenga 1985b). The fossil material assigned to this species consists of a distal tibiotarsus and an associated proximal tarsometatarsus. Olson (1985) further mentioned undescribed Cathartidae from the early Oligocene of Mongolia.